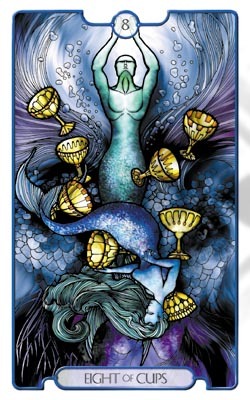 I pulled the Eight of Cups this morning with the intention of looking for connections to it throughout my day. The first thing it reminded me of was the sun salutations I've just begun practicing. The merman swimming to the surface almost resembles someone in the extended mountain yoga pose. I also connect to this card because I'm trying to leave behind habits that no longer serve me while trying to establish new healthier habits. Still, I am holding onto some habits for the pure hedonistic pleasure of them, and maybe this card is telling me something better awaits if I could only let go.